File Name: Dashiell R. Faireborn of Wichita, Kansas. Notes: Wichita is in the south central part of the state and home to McConnell Air Force Base and several aircraft manufacturers. Also from Wichita is Lightfoot. Filecards from 1991 to 2005, and two later ones, spell Flint's last name Faireborne. 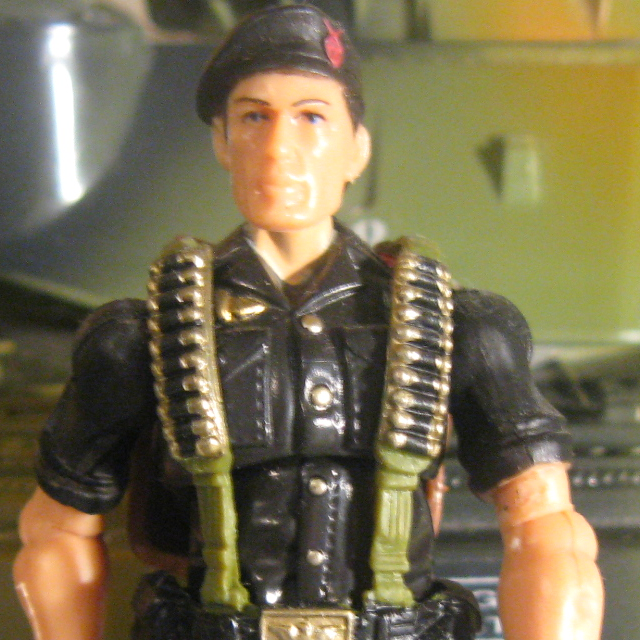 Sunbow's Flint wore his 1985 outfit, but with a dark green shirt and reddish brown straps. His beret ranged in color from blue to grey, and his hair was brown. The series romantically paired Flint with Lady Jaye. The Transformers featured a character named Marissa Faireborn whose father was voiced by Bill Ratner and who may have been intended as Flint's daughter. 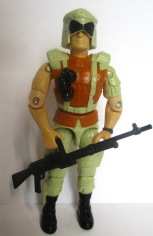 Flint's 1988 outfit was animated for an ad for the Tiger Force toys. In the DiC series, Flint wore his 1991 outfit. The Reel FX films used his 2003 outfit. Accessories: green I-12 pump-action shotgun with short barrel (new), green backpack with engraved canteen tilted to the right, grenades, and dynamite (new). Flint was a Rhodes Scholar and earned his degree in English Lit. Bored by the Groves of Academe, he enlisted in the Army and applied the tenacity and concentration he had used so well scholastically to grind his way through Airborne School, Ranger School, Special Forces School, and finally Flight Warrant Officers School... Graduating each with top honors. A thorough tactical planner, Flint drafted and personally led a half dozen rescue missions in hostile territories that for obvious reasons of security were never publicized let alone admitted to. "We had thought COBRA had us in the stinking dungeon for good - So we didn't know what was going down when we heard that chopper comin' in and all the heavy hardware going off like the Fourth of July. Then somebody kicked down the door to our cell and when the smoke cleared, there was Flint with that lop-sided grin sayin' 'C'mon boys, we're going home...'"
Toy Notes: Item #6436. Featured in the Terror Drome commercial. Accessories: dark grey shotgun (85 Flint's), dark grey backpack (85 Flint's). FLINT was a Rhodes Scholar and earned his degree in English Lit. Bored by the Groves of Academe, he enlisted in the Army and applied the tenacity and concentration he had used so well scholastically to grind his way through Airborne School, Ranger School, Special Forces School, and finally, Warrant Officers Flight School...graduating each with top honors. A thorough tactical planner, Flint personally led a half dozen rescue missions in hostile territories that were never publicized for obvious reasons of security. "We had thought COBRA had us in the stinking dungeon for good - So we didn't know what was going down when we heard that chopper comin' in and all the heavy hardware going off like the Fourth of July! Then somebody kicked down the door to our cell and when the smoke cleared, there was Flint with that lop-sided grin sayin' 'C'mon boys, we're going home...'"
Accessories: dark blue thick plasma rifle with trigger in trigger guard (new), dark blue water cannon with orange hose (new), yellow full-head helmet with large yellow goggles (new), dark blue frame backpack holding square orange water bulb (new). A graduate of Special Forces School as well as the Flight Warrant Officers' School and a former Rhodes Scholar, Flint was a natural choice to head up the new G. I. Joe Environmental Force. When equipped with a HALO (High Altitude Low Opening) parachute, Flint can also be inserted into a Cobra toxic sludge operation with his Anti-Tox missiles and laser weapons system and stop evil polluters before they can do their damage. "All those toxic waste Cobras had better watch out, now that FLINT is on the job. He is one tough, snake-eating, hill-climbing, no-guff-taking, no-nonsense paratrooper, and when it comes to polluters, it's like he has a personal axe to grind. The last guy he caught puffing on a cigarette in an elevator ended up eating it." Toy Notes: Features a temperature-based color change. Item #6815. In the 1991 insert catalog, concept art appears instead of the actual figure. Accessories: black submachine gun (88 Hit & Run's), black rifle (90 Ambush's), black machine gun (91 Big Ben's), orange gun-shaped spring missile launcher with short grip and black trigger (new), two black spring missiles (93 Bazooka's), tan desert helmet with black goggles (new), black figure stand (common). A graduate of Special Forces School as well as the Flight Warrant Officers' School and a former Rhodes Scholar, FLINT enjoys a well known - and well deserved - reputation as an expert in desert battle tactics and training. But he is especially renown [sic] for being a top-notch paratrooper, successfully completing difficult missions behind enemy lines after skydiving with a HALO (High Altitude Low Opening) parachute from heights of 40,000 feet. He's a tough, snake-eating, no-guff taking commando who has the unique ability to lower his body temperature and adjust to the boiling hot rays of the desert sun. Motto: "Jumping out of a plane at 40,000 feet is easy. Landing in desert sand is the hard part!" What can you say about a guy who likes to skydive in the desert where there is nothing but scorpions, rattlesnakes, and miles of sand awaiting him? Get a better hobby? Not Flint. A product of the Special Forces School and a career Army officer, Flint has always been a daredevil and take-charge individual. This guy is so tough that during one nighttime airborne assault mission, he leaped out of a C-5 transport at 30,000 feet, dove head-first to the ground, then at 900 feet pulled up and made a soft landing minutes before anyone else even came close to the landing zone. How he did it is anybody's guess. All we know is that Cobra's resistance forces were wiped out by the time the rest of the G.I. Joe assault team landed. As the driver for the Desert Striker, Flint has the task of leading the G.I. Joe team against Cobra's most lethal forces. Never one to turn down an assignment, Flint accepted it on one condition. He requested that he field test the Desert Striker vehicle's "airborne capability" from a 5,000 foot drop behind enemy lines. Only Flint would dare to make such a request. Only Flint would get it. A classical scholar, as well as a graduate of the Special Forces School and Flight Warrant Officers School, FLINT brings a broad intellectual background as well as finely-honed technical skills and tactical knowledge to the G.I. JOE Team. He is proficient with all NATO small arms, explosive devices, and rated to fly all current U.S. military helicopters as well as rotary wing aircraft in the services of most western and former Soviet Bloc powers. FLINT is believed to have participated in or led numerous covert hostage rescue missions in hostile territories and in domestic COBRA strongholds. The exact nature and details of these missions are highly classified and unlikely to be made public or even acknowledged. It doesn't bother FLINT in the least that he will never receive credit for these missions, nor be awarded decorations or citations. "I didn't do it to get promoted," he said, "I did it to bring those Americans home." The resident intellectual of the G.I. JOE team, FLINT finds the BARONESS especially despicable because of her intelligence and educational background; he thinks she should simply know better. "We're not heroes, we're just doing our job." Variations: This figure was identified as Rock 'n Roll when the Headquarters was originally released in fall 2001. Toy Notes: Boxed with the Toys 'R Us-exclusive reissue of this Headquarters recolor. Item #53076. Accessories: black submachine gun (92 Shockwave's), black machine gun (from 01 Desert Striker, with Sound Attack tab), silver knife (91 Low-Light's), black backpack (91 Dusty's). Toy Notes: Carded in a two-pack with Baroness. Item #53208. Accessories: black pistol (91 Dusty's), black oversized XM29 OICW prototype battle rifle with scope (new), black rectangular parachute pack with harness (new). A classical scholar, as well as a graduate of the Special Forces School and Flight Warrant Officers School, FLINT brings a broad intellectual background as well as finely-honed technical skills and tactical knowledge to the G.I. JOE Team. He is proficient with all NATO small arms, explosive devices, and rated to fly all current U.S. military helicopters as well as rotary wing aircraft in the services of most western and former Soviet Bloc powers. FLINT is believed to have participated in or led numerous covert hostage rescue missions in hostile territories and in domestic COBRA strongholds. The exact nature and details of these missions are highly classified and unlikely to be made public or even acknowledged. It doesn't bother FLINT in the least that he will never receive credit for these missions, nor be awarded decorations or citations. "I didn't do it to get promoted," he said, "I did it to bring those Americans home." Toy Notes: Carded in a two-pack with Black Out. Item #57410. Accessories: black submachine gun (84 Firefly's), black backpack (84 Firefly's), black walkie-talkie (new). A classical scholar, as well as a graduate of the Special Forces School and Flight Warrant Officer School, FLINT brings a broad intellectual background as well as finely-honed technical skills and tactical knowledge to the G.I. JOE team. He is proficient with all NATO small arms, explosive devices, and rated to fly all current U.S. military helicopters as well as rotary wing aircraft in the services of most Western and former Soviet Bloc powers. FLINT is believed to have participated in or led numerous covert hostage rescue missions in hostile territories and in domestic COBRA strongholds. The exact nature and details of these missions are highly Classified and unlikely to be made public or even acknowledged. It doesn't bother FLINT in the least that he will never receive credit for these missions, nor be awarded decorations or citations. "I didn't do it to get promoted," he said. "I did it to bring those Americans home." "We're not heroes. We're just doing our job." Toy Notes: Carded in a Toys 'R Us-exclusive set with Short-Fuze, Action Man, Tunnel Rat, Roadblock, and Beachhead. Item #50802. 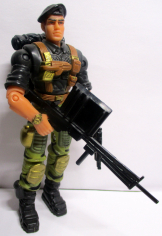 Reissued in April 2005 with the Toys 'R Us-exclusive G.I. Joe Moray Hydrofoil, along with Beachhead. Item #61238. Toy Notes: Item #6992. Due to uneven distribution, this vehicle is considered a moderately hard-to-find item (though not especially high-demand for its size). Accessories: black shotgun (03 Destro's), black rifle (04 Cobra Trooper's). FLINT is a classical scholar and graduate of the Special Forces School and Flight Warrant Officers School. He brings a broad intellectual background as well as finely honed technical skills and tactical knowledge to the G.I. JOE Team. He is proficient with all NATO small arms and explosive devices, and rated to fly all current U.S. military helicopters as well as rotary wing aircraft in the services of most western and former Soviet Bloc powers. FLINT has been part of or led numerous covert hostage rescue missions in hostile territories. The exact nature and details of these missions are highly classified and unlikely to be made public or even acknowledged. It doesn't bother FLINT in the least that he will never receive credit for these missions, nor be awarded decorations or citations. "I didn't do it to get promoted," he said, "I did it to bring those Americans home." Toy Notes: Carded in a three-pack with Tunnel Rat, Gen. Abernathy, and a reprint of Marvel #74. Accessories: black pistol (06 Med Alert's), green shotgun (03 Destro's), brown webgear: belt and straps with green slots holding gold shells (new), black Joe figure stand. FLINT was a Rhodes Scholar and earned his degree in English Lit. Bored by the Groves of Academe, he enlisted in the Army and applied the tenacity and concentration he had used so well scholastically to grind his way through Airborne School, Ranger School, Special Forces School, and finally Flight Warrant Officers School, graduating each with top honors. A thorough tactical planner, FLINT drafted and personally led a half dozen rescue missions in hostile territories that for obvious reasons of security were never publicized let alone admitted to. We had thought COBRA had us in the stinking dungeon for good - so we didn't know what was going down when we heard that chopper comin' in and all the heavy hardware going off like the Fourth of July. Then somebody kicked down the door to our cell and when the smoke cleared, there was FLINT with that lop-sided grin sayin', 'C'mon boys, we're goin' home...'"
Toy Notes: Item #25181. Due to uneven distribution, this figure was considered a moderately hard-to-find item at the time of its release. Accessories: dark green pistol (06 Med Alert's), dark green shotgun (03 Destro's), green webgear with gold buckle and shells (07 Flint's), black Joe figure stand. FLINT was a Rhodes Scholar and earned his degree in English Lit. Bored by academia, he enlisted in the Army and applied the tenacity and concentration he had used so well scholastically to grind his way through Airborne School, Ranger School, Special Forces School, and Flight Warrant Officers School, graduating with top honors. A thorough tactical planner, FLINT personally led a half dozen rescue missions in hostile territories that for reasons of security were never publicized. 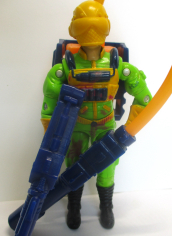 He is one of the leaders of the TIGER FORCE special assault group that goes behind enemy lines using captured enemy equipment. "We had thought COBRA had us in the stinking dungeon for good, so we didn't know what was going down when we heard that chopper comin' in and all the heavy hardware going off like the Fourth of July. Then somebody kicked down the door to our cell and when the smoke cleared, there was FLINT with that lop-sided grin sayin', 'C'mon boys, we're goin' home...'"
Accessories: graphite rifle (08 Tomax's), black knife with silver guard and blade (07 Cobra Officer's), blue helmet (07 Cobra Trooper's), Cobra Trooper head with black or brown hair and black face mask (new), black Cobra figure stand. FLINT was a Rhodes Scholar and earned his degree in English Literature. Bored by the Groves of Academe, he enlisted in the Army and applied the tenacity and concentration he had used so well scholatically to grind his way through Airborne School, Ranger School, Special Forces School, and finally Flight Warrant Officers School, graduating each with top honors. A thorough tactical planner, FLINT drafted and personally led a half dozen rescue missions in hostile territories that for obvious reasons of security were never publicized let alone admitted to. "I needed to get inside a COBRA base. Heavily guarded. Teeming with troopers. A frontal assault wouldn't work. So I 'persuaded' a trooper to loan me his uniform and went right through the front door. The rest, as they say, is history." Toy Notes: Item #30942. This figure has a Cobra figure stand, in keeping with his disguise. Flint wore such a disguise in the Sunbow cartoon series, during part 2 of The Revenge of Cobra. Accessories: black pistol (06 Med Alert's), black I-12 pump-action shotgun with short barrel and brown fore-end (new), black rifle (83 Snow Job's), brown belt and green straps with black slots holding silver shells, has hole for backpack peg (new), brown backpack with engraved canteen tilted to the right (new), black Joe figure stand. FLINT was a Rhodes Scholar and earned his degree in English Literature. Growing restless with academia, he sought new challenges and enlisted in the Army, where he tapped into his tenacity and concentration to complete Airborne School, Ranger School, Special Forces School, and Flight Warrant Officers School with top honors. His self-confidence and arrogance may irritate some team members in the Pit, but they're driving forces to a mission's success out in the field. He's led many dangerous rescue operations, most of which are classified for security reasons. Once you get past his blunt, forceful nature, you quickly realize that his entire focus is on supporting the team with no thought to his own safety or the praise of others. Toy Notes: Boxed with Snake Eyes, Lady Jaye, G.I. Joe Hawk, and Shipwreck. Item #36449. Accessories: black pistol (06 Med Alert's), green shotgun (03 Destro's), black shotgun with brown fore-end (09 Flint's), black belt and green straps and black tabs holding silver shells (09 Flint's), brown backpack with black grenades (09 Flint's), flat-gold Joe figure stand. "We had thought COBRA had us in the stinking dungeon for good - so we didn't know what was going down when we heard that chopper comin' in and all the heavy hardware going off like the Fourth of July. Then somebody kicked down the door to our cell and when the smoke cleared, there was FLINT with that lop sided grin sayin', 'C'mon, boys, we're goin' home...'"